After her body is crushed beyond repair in a freak car accident, it is a miracle when Lia Kahn opens her eyes and finds herself inside a new, perfect body. Lia’s wealthy father paid for her to undergo “The Download,” which involves taking a person’s brain and transferring its human memories into a mechanical body. This procedure is miraculous, but Lia wishes more than anything that her parents would have let her die. They won’t touch her, she can’t eat or sleep, and her boyfriend won’t even look at her. Though she was once the most popular girl in school, Lia now feels alone, isolated, and hated by the world for being a “mech-head.” She finds herself entangled with a group of people like her who are determined to pit themselves, the “mechs,” against the “orgs,” the humans. Lia finds herself torn between the human she wants to be and the mech that that she has become, and she ultimately runs away from home to permanently join the mechs. 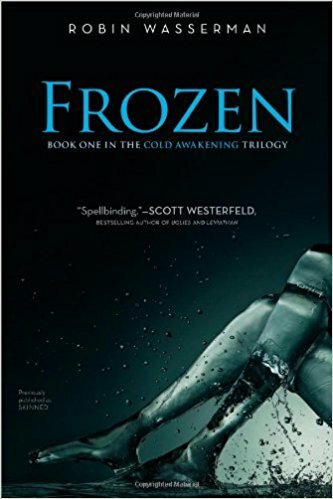 Robin Wasserman’s Frozen is the first book in the Cold Awakening trilogy and leaves the reader motivated to continuing reading Lia’s story. The novel ends right after Lia runs away to join others like her, which would have been interesting to read more about in Frozen but will certainly be addressed in the following books. Although the plot and subject matter is reminiscent of many other dystopian series, the concept has just enough originality to keep readers interested. However, the reader should be aware that the ethical questions posed by the novel are more interesting than the characters themselves; the characters are not particularly well-developed, and even Lia does not change very much or become more likeable. That being said, readers who favor dystopian fiction and stories about “technology gone wrong” would likely enjoy this book. The novel has a bleak tone overall, and the isolation that Lia undergoes is relatable and fosters sympathy in the reader. Frozen uniquely approaches issues of identity, self-worth, and the definition of life in a futuristic society that both uses and fears technology. *Contains moderate violence, moderate sexual content, and severe language.